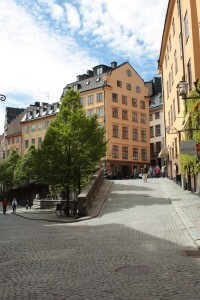 The first thing to know about Stockholm is that it can’t be done in a day. So just forget it. You’re going to have to focus. 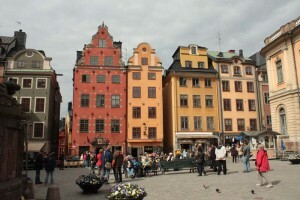 If you want to get the most bang for your time, however, then that focus should probably be Gamla Stan, the city’s Old Town. And this is especially the case if, like me, you have come to this city for the architecture. Stockholm is a beautiful city no matter where you go, and when I take a 20-minute ride on a city bus to the medieval Old Town, I’m already salivating just looking out the window, where almost every building that flashes by looks like a work of art. 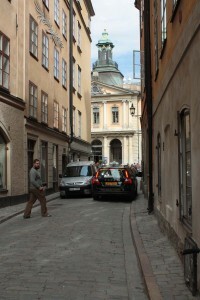 But when I step off the bus in Gamla Stan, and find myself looking up at the narrow wrought iron spire of Riddarholmen Church, the oldest surviving church in the city, I feel momentarily dumbfounded. Built in 1270, it is the final resting place of Swedish kings and queens, the first king having been buried here in 1290. No tour here would be complete without a visit to the Stockholm Cathedral, originally constructed in the 13th century, though its current incarnation reflects the Baroque architecture of the 17th century. 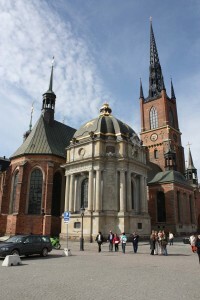 The local parish church for Gamla Stan, this is where Sweden’s royals are married, the most recent nuptials having taken place here in June with the wedding of Crown Princess Victoria to Mr. Daniel Westling. The Swedes love their Royals almost as much as the British do, and images of them can be found in every gift shop in the city. I decide to get a taste of Royal Swedish life by visiting the Royal Palace, the official palace of the Royal family. The palace as it exists today was completed in 1754, and most of the interiors reflect the tastes and styles of the 18th and 19th centuries, though there are several rooms featuring elaborate Baroque style ceilings rich with a mixture of paintings and sculpture that meld into one another like a 3-D landscape. The palace also has its own Hall of Mirrors modeled on the one at Versailles. The palaces are typically crowded with visitors, particularly during the changing of the guard and in the Royal Apartments. But among the best places to visit in the palace complex is the Royal Armory with its collection of coronation coaches, personal armor, christening cradles, and royal wedding attire. You can make a day-long tour of Gamla Stan especially easy (and cheap) through the purchase of a Stockholm Card, which provides free access to all the historic buildings, museums, and also free transportation, including use of the city’s Hop-On Hop-Off boats, which ply Stockholm’s waters, providing tourists easy access to attractions all over the city, including the Vasa Museum, home to the world’s only surving 17th-century ship. Wondering where to grab a bite to eat? It’s rather hard to go wrong here with so many lovely cafes fronting the cobblestone streets, but if you happen to tour the Nobel Museum, consider lunch at their Kafe Satir, where all the chairs have been signed by Nobel laureates. The food is divine–oozing Swedish sandwiches loaded with meat and cheese accompanied by a salad bar, flat bread slathered in butter, and some divine pastries. And the best thing is the fare is inexpensive. Two can dine here for lunch for about $20 USD, and if you know anything about Scandinavia, that’s a steal.